Man’s best friend, but other dogs? 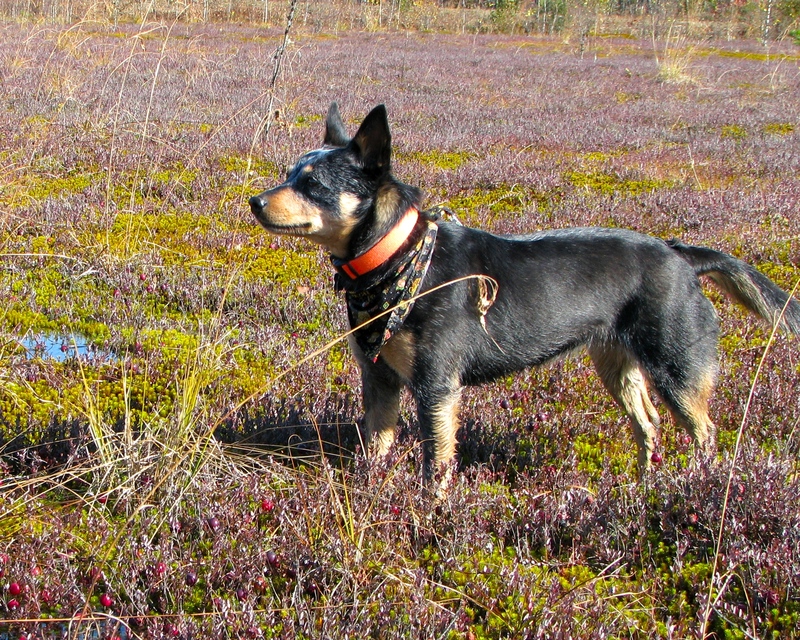 Sadie on an outing to the cranberry bogs. My husband and I have always had dogs. We adopted our first from a rescue shelter in Burbank, CA. Smitty was a mixed breed puppy that was classified as a terrier mix. About ten years later we rescued an abandoned shepherd mix that the kids found at the little league field begging for hot dogs from beneath the stands. Zeke had been living on his own for a while before we found him so it was a couple of months before we were able to domesticate him. He turned out to be a great companion to our family, going with us on hikes and camping trips and even chasing a bear away from our campsite near Hume Lake one summer. We took in our third dog a few years later when a friend was moving to a smaller place that wouldn’t accommodate their large Australian shepherd. So by the time we moved to Maine we had over 25 years experience raising and living with dogs. I had every reason to believe that the dog that we rescued from the Bangor Humane Society would adjust to her new surrounding just as the others had. But Sadie is not like the other dogs we have had in the past. She is an Australian Cattle Dog weighing in at just under 30 pounds, all muscle. She was about two years old at the time we adopted her. We knew that by breed she would be high energy and that was OK as we are very active, outdoors type people. The sign on her cage said she was a bit of a wallflower and indeed for the first couple of months she was with us, we barely heard a peep out of her. It didn’t take long to discover that she had some issues from her past that would continue to haunt her. First it was her fear of nearly all implements. Pick up a shovel or broom and she would immediately run away and cower in a corner. She likes to chase cars and bite their tires. Being a herder, she likes to keep everyone together and becomes agitated if friends get up too quickly and/or get ready to leave. We have worked with her on socialization and she has gotten better in a lot of ways but there is one issue we have not been successful in changing. She is what her veterinarian calls dog aggressive, in other words she doesn’t play well with other dogs. Knowing that she has this trait, we make sure that we keep her on a leash when other dogs are around. I don’t let her outside when other dogs are walking down our rural street. And if we encounter other dog owners when we are out for a walk who don’t feel the need to leash their own canines because “they are just friendly, lovable dogs”, we warn them that Sadie does not get along well with other dogs. Nine times out of ten, these fellow dog owners make no effort to leash their animals and even allow their pets to approach Sadie. Though I hold her on a short leash and try to keep her calm, if the other dog gets too close to Sadie (or me) it’s game on. Fortunately, most of these dogs are quick to retreat as Sadie quickly gets the upper hand. Their owners are upset, but this whole problem could be avoided if people would leash up or control their dog(s) until they go past. This entry was tagged Dog aggressive, leash dogs, rescues dogs, responsible dog owners, Shelter dogs, socialization. Bookmark the permalink.